Datamax-O'Neil's I-Class revolutionized the barcode printer industry with its award winning modular design, field installable options and rugged reliability. For the past several years, resellers have named the I-Class the 'best channel product's in some of the industry's largest third-party surveys. Now we've raised the bar even higher, with the redesigned I-Class Mark II. Offering the fastest processor, largest memory and widest selection of communication ports available in a mid-range printer, the I-Class Mark II provides lower operating costs and flawless print quality. For applications as diverse as shipping and receiving, product identification, pharmacy labeling and asset tracking, the I-Class Mark II will maintain its reputation for providing outstanding for performance, reliability and value. Versatile - I-Class Mark II printers can be used in a wide variety of industrial applications with a range of media compatibility, connectivity, emulation support, and options. I-Class Mark II offers a complete range of printers with 203, 300, and 600 dpi models with the best value proposition for mid range industrial class printers. Increased productivity I-Class Mark II easily keeps up with high speed label demand applications, boasting 20% faster performance than the nearest competitor in its class. With a 400 MHz processor, the throughput of the printer is fastest in the mid range industrial printers in the industry. Its modular design facilitates adding and/or changing options with ease, making it easy to upgrade and reconfigure for business growth. A printing method that uses ribbon to produce exceptional image clarity, as compared to most direct thermal media types. The 4-section split-hub design allows for lower torque on narrow ribbons. This option can be used with either coated-side-in or coated-side-out ribbons. An output control device that allows subsequent printing to occur only after the removal of a previously printed label. The external rewinder (up to 4.5" wide and 8" OD roll) is used for rewinding labels onto a roll as they are printed. This allows for batch printing large continuous rolls of labels or tags and distributed for use. An internally "overdriven" design for heavy duty requirements using aggressive adhesive or polyester type media. Minimum label length is 1.5 inches (38 mm). Plug-and -play: attach the cutter and it is auto detected during power up. The rotary style mechanism is capable of cutting media from 0.0025" to 0.0100" (0.0635mm - 0.254mm) thick, and has a minimum lifespan of 500,000 cuts. 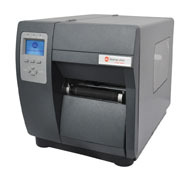 A heavy-duty label rewind option to tightly rewind a partial 5.5" roll of labels and backing onto a 3" diameter core. Internal LAN (Ethernet) Port allows for network connectivity, sharing and management. LAN connectivity provides more efficient use of the printer. GPIO Option (applicator card) The GPIO signals provide the Applicator (external device) the ability to control the printer using TTL logic. Wireless LAN Option has the same benefits as the LAN port with the additional benefit of not requiring a wired connection which allows for mobility and eliminates investing in network wiring expansion. SDIO Memory Option provides a removable memory option for the printer. This memory may hold labels, fonts, fir ware and graphics. The user can use this memory to transfer these types of files to the printer's internal memory or leave the memory inserted for real time access to the SDIO memory files. In addition to the above field installable options, I-Class Mark II is offers the above mentioned LAN, W-LAN, 2 USB Host Ports & SDIO as options that can be installed in the field by certified technicians. Datamax-O'Neil printer solutions offer easy software setup, navigation and customization for personal requirements. Combined with optional remote management and software tools, Datamax-O'Neil printers minimize human intervention and automate many of the tasks usually required by operators and technicians. NETira Configuration Tool is part of the Datamax-O'Neil suite of applications. It is a Windows based software application that allows easy access and setup of the I-Class Mark II printer. It can be used with any communication port available on your printer and allows you to store settings to be applied to a different printer. This is ideal when you are replacing or adding printers to your application. The I-Class Mark II has a resident web page embedded into the firmware that is accessible via a web browser. The web page allows full access to the printer's settings and allows complete configuration. Accessing the printer via the Embedded Browser Configurator is easy: simply connect the printer to the network, start the browser program, and enter the printer's IP address. The resident web page will pop up and printer is up and running without needing to install software or a specific operating system.